The most precious woods are renowned for their hardness, but many other species are appreciated for their specific qualities, colour, grain, perfume. 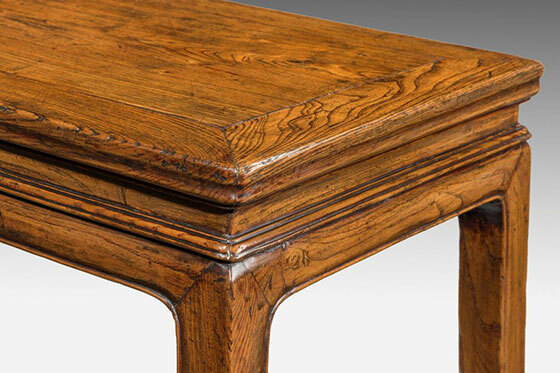 Elm is traditionally the most widely used species. This is the most expensive wood in the world, and the only wood that does not float in water. Zitan wood is so dense that it sinks. The wood is written about in ancient China as being worth as much as gold. 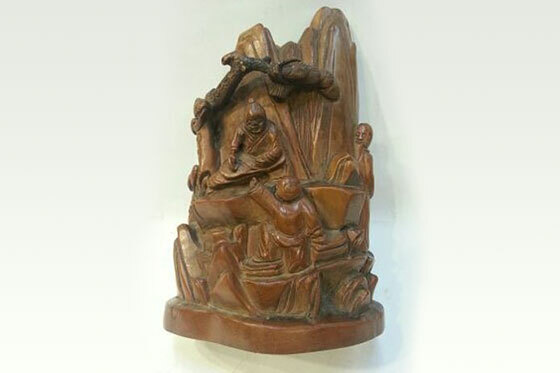 It is the most prized and valuable wood used in Ming and Ching Dynasty furniture, although very few Zitan wood pieces exist from the Ming Dynasty, except in museum collections. This wood is relatively inexpensive. From the Santalaceae family, (pterocarpus indicus), it is genetically close to "Zitan" and comes from the same regions. However, it has a very different colour. The species produced in India has been imported into China for more than four hundred years. The wood is light brown to yellow with fine, marked veins. The species of Hainan (dalbergia odorifera) called "XIN HUALI" (literally, new rosewood), has a very characteristic incense smell. The grain of this wood allows decorative effects. This wood is also considered to be a type of rosewood and is probably the heaviest and densest of the rosewoods. 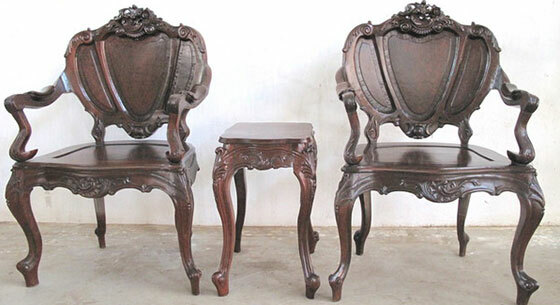 Often used in Ching Dynasty furniture, it is the most popular wood sought by the coastal Chinese collectors. From the Ebénacées family, (maba ebenus) it is black, hard and heavy and grows in equatorial regions such as Ceylon, Southeast Asia and also Yunnan and Hainan. This is an expensive wood, named for its feather-like grain which recalls not only the tight pattern found in plumes but the iridescent play of light and shadows similar to that seen on some chicken or pheasant feathers. 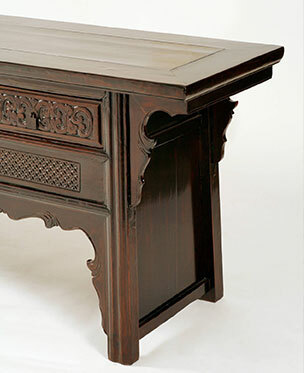 Often used for Ching furniture, there are also a few existing examples of Ming furniture made with Ji chi mu.. Similar in colour and grain to Ji chi mu, but not as dense and heavy, this wood has been dubbed the ‘poor man’s Ji chi mu’. 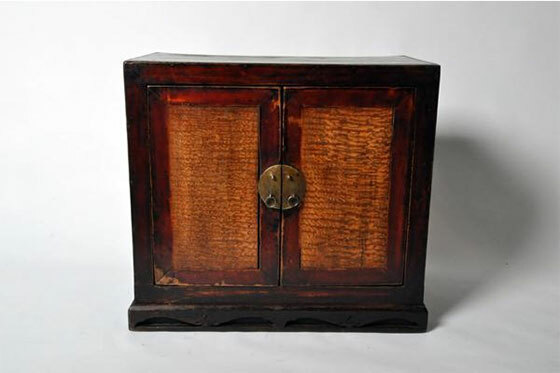 But when furniture pieces from the Ming Dynasty are found which are made from this wood, they are in fact very costly..
From the Lauraceae family, (machilus nanmu) it gives a light, fragrant, fairly light-coloured wood, prized because it does not expand with humidity and does not shrink with heat. Used for house frames, palace pillars, boats, chests, cabinets and coffins. The burr or curly wood (yingmu or yingzi) of nan mu is used in cabinet making for its cluster-shaped veins.This large tree is found in the south-central and southeastern provinces of China. . Considered a rare and excellent quality wood by furniture dealers and collectors, He tao mu is a dense wood with a more delicate and beautiful grain than Yu mu. Usually used in North China, and specialy for Ming and Ching furniture. 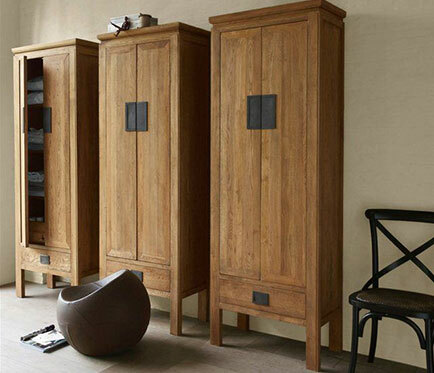 Teak wood is extremely prized, especially in warm countries, for its incredible durability. 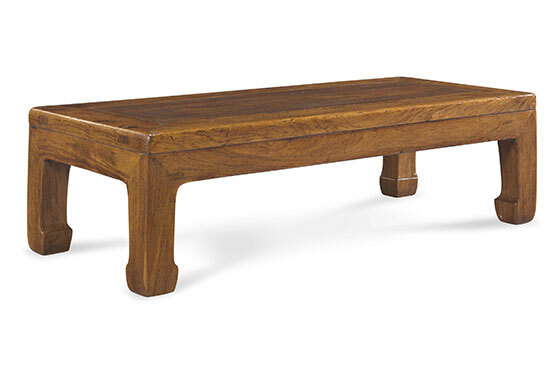 Beams of teak wood that are hundreds of years old have been found in good shape in India and in Burma, and teak beams have stood the test of time in palaces and temples from more than a thousand years. Under cover, this wood is practically indestructible. 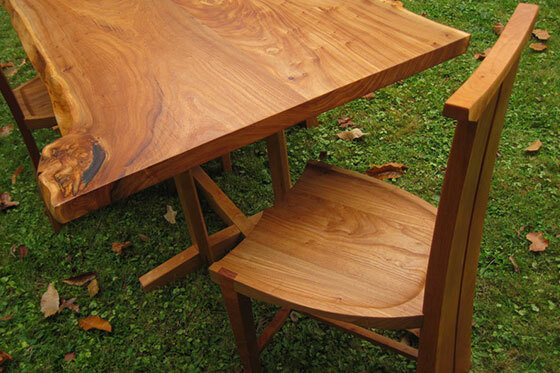 Termites eat the sapwood, but rarely touch the heartwood.Teak has excellent stability. Besides being used for fine furniture and decorative items, teak is used for shipbuilding, door and window frames, wharves, bridges, cooling-tower louvres, flooring, panelling and Venetian blinds.. It belongs to the Ulmaceae family, (ulmus sinensis). 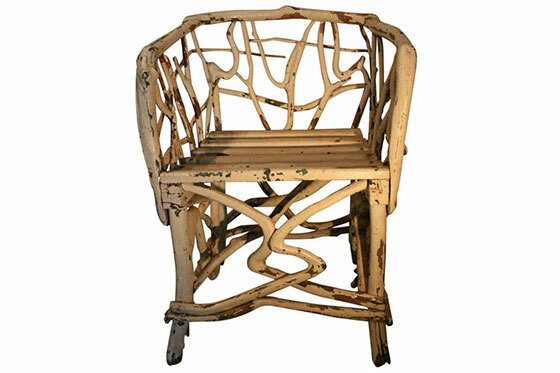 This tree with serrated leaves, solid and soft wood is used for 95% of Chinese furniture. We can distinguish in particular the "Nan Yu" or "Ju Yu", the southern elm with large leaves. Its light brown wood is hard and dense, with a very beautiful grain. Its veins form mountain shapes.The wood of the century-old elm tree becomes reddish, hence its other name "Zi YU", red elm or blood wood. It is found in the southern provinces. Unknown in northern China, it is considered a. Smooth and silky, its wood is extremely dense, smooth and without obvious grain. 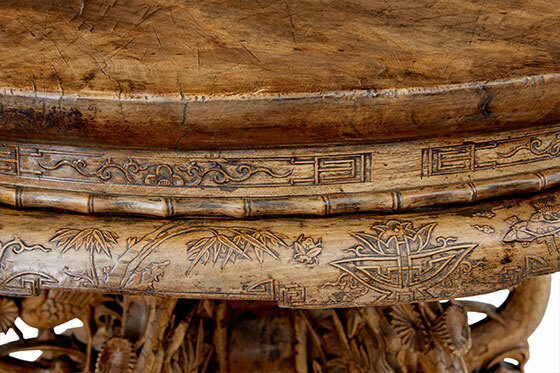 This blonde wood is used for both Northern and Southern Chinese furniture, but the Bai mu furniture from the north is the more highly prized. This luxurious wood, which is much denser and harder than the American cypress, can be found in pieces dating from the Ming Dynasty. 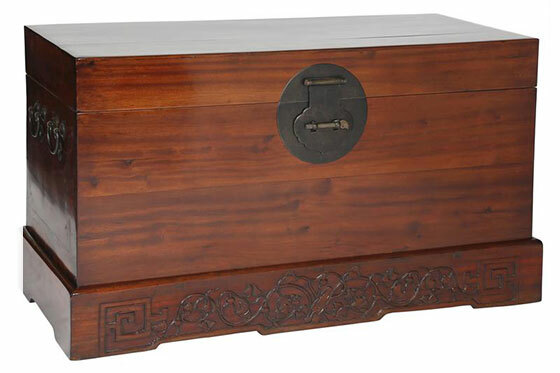 Valued by the Chinese because of its density, its grain and and its ability to repel bugs (similar to cedar in this respect), Zhang mu is used in both Northern and Southern Chinese furniture.. It belongs to the Bignoniaceae family (catalpa). It is a large tree with large leaves and flowers in large bunches. 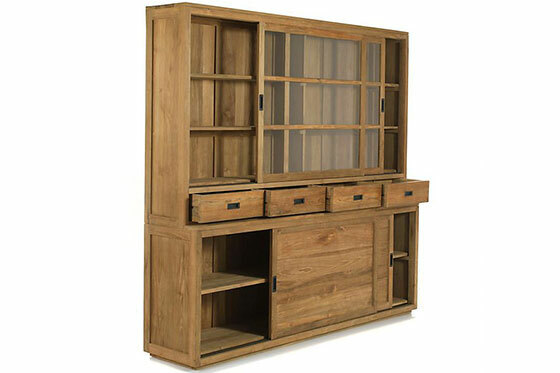 Its wood is hard and solid, it often replaced mahogany, which is much more expensive. Used to make coffins, these trees should not be planted too close to homes because they brought bad luck. 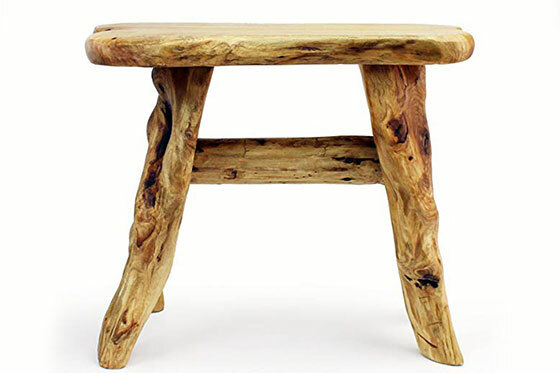 This wood is not very commonly found in old furniture surviving today, with the exception of a certain kind of Southern stool with bamboo slats. 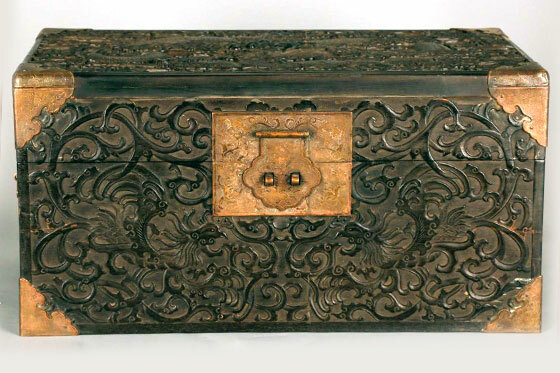 Although rare, there are also examples of Ming Dynasty furniture made of this wood. From the Buxaceae family, (buxus) its ivory-coloured, hard wood is used to make small carved objects or inlays in other woods. Ying mu is not a specific type of wood, but a type of cut, near the root of a certain variety of trees. Since it is only a small section of a few types of trees, it is costly since ancient times in China. 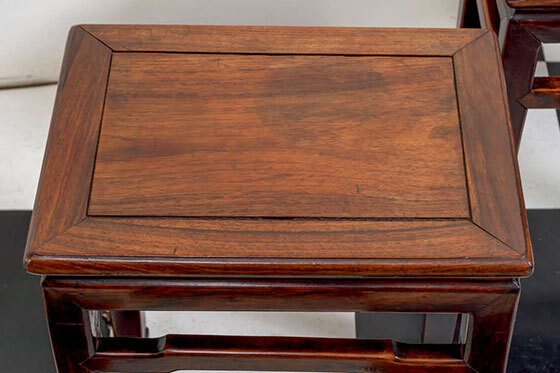 Some woods are more expensive than others, but all types of Ying mu are highly treasured by Chinese wood workers.Because of its limited availability and high cost, it is often used only for small parts of furniture. . 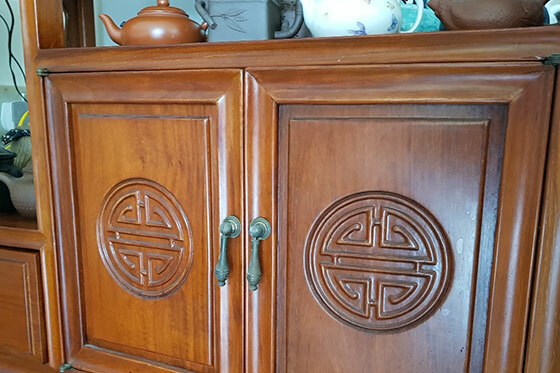 This wood is often used for less expensive furniture pieces, like kitchen cabinets with Hong chu (lattice design), in Southern China. . Belongs to the family of Pinaceae, (cunninghamia sinensis). This tree belongs to the family of legumes, (sophora japonica). It is a large ornamental tree. Its fragrant flowers are used to make cosmetics and dyes. From the Tiliaceae family, its white wood is easy to work with. It is used for the interior parts of furniture. From the Salicaceae family, (populus suavuolens), it is a large tree that grows in temperate and humid regions. Its long and narrow trunk is sought after in carpentry and stationery. We can distinguish the aspen tree with trembling leaves that grows in the forest and the white poplar "Baiyang Shu" that grows near watercourses. .
On distingue le peuplier tremble aux feuilles tremblantes qui pousse en forêt et le peuplier blanc « Baiyang Shu » qui pousse près des cours d’eau. From the Salicaceae family, (populus suavuolens), it is a large tree that grows in temperate and humid regions. Its long and narrow trunk is sought after in carpentry and stationery. We can distinguish the aspen tree with trembling leaves that grows in the forest and the white poplar "Baiyang Shu" that grows near watercourses.